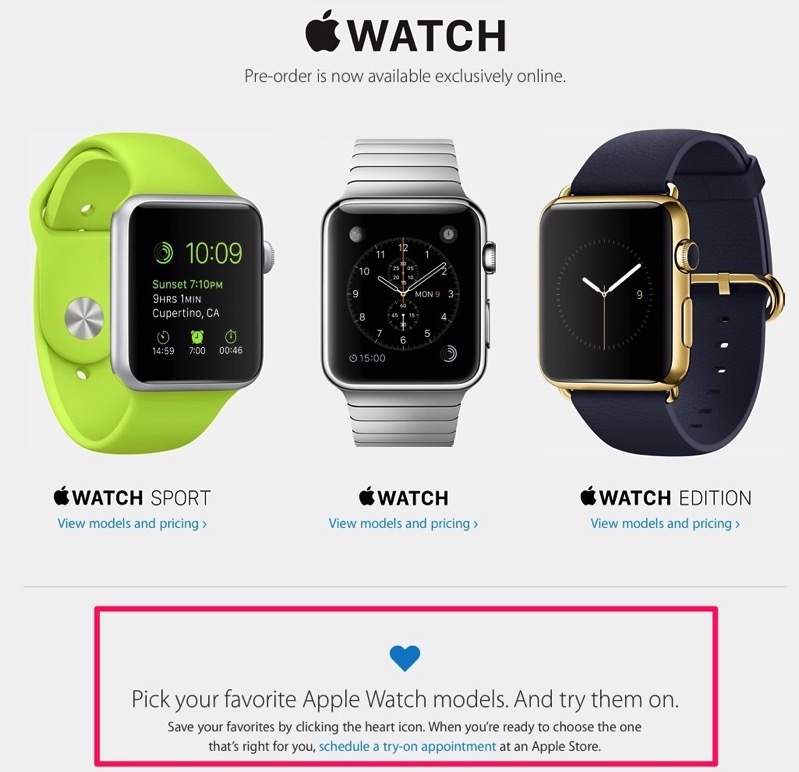 When Apple Watch pre-orders launched last night after 12:01AM PDT/3:01AM EDT, the race was on to get in your order for the first wave. We used the Apple Store iOS app on our iPhone 6 Plus and managed to order a 42mm Space Grey Sport, but with a May 21-June 2 (4-6 weeks) ship date, despite thinking we had quick trigger fingers. Looks like this model was one of the most popular. 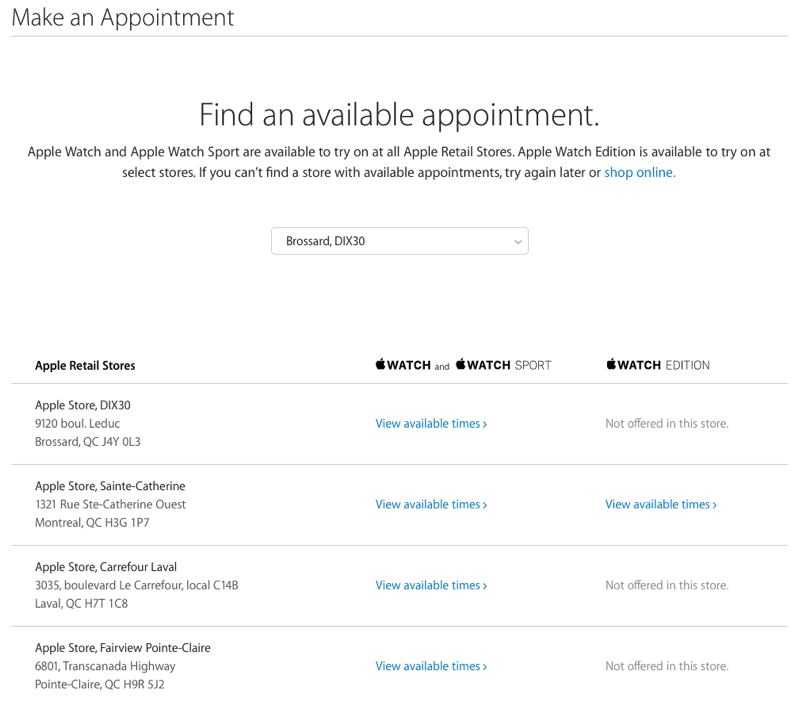 Last night also saw Apple Watch try-on appointments go live. This process allows users to book 15-minute time slots to go try on an Apple Watch, make a decision then go book online. Too bad as of now, the initial wave of supplies have sold out and most are now shipping in June or beyond. 1. 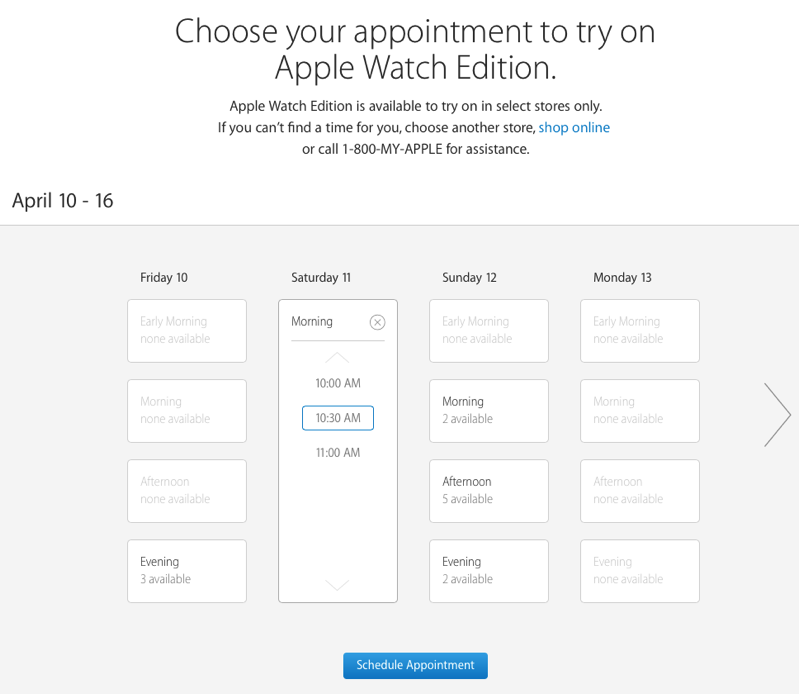 Visit the Apple Store page and click on the schedule a try-on appointment link, found here. That’s pretty much it. You show up and then an associate will guide you through the process, which Apple Canada detailed today to select members of the media in Toronto at the Eaton Centre retail location this morning. Having this one-on-one interaction with another human being and being able to get up close and personal with the watches changes a lot of perceptions one might have. Looking at photos and videos doesn’t do justice to how the watch looks and feels in real life. The things that surprised me the most were the kight weight of the Sport version, the level of detail and integration on the watch as well as how organic and natural it does feel on one’s wrist. I strongly suggest that anyone that’s thinking of buying the Watch go through the preview process. I had wanted to order the smaller-sized Watch thinking it would fit me just fine and hoping I could save some money and still get everything the device offers. Getting to try both sizes out gave made it clear that the larger size was a better fit for me. 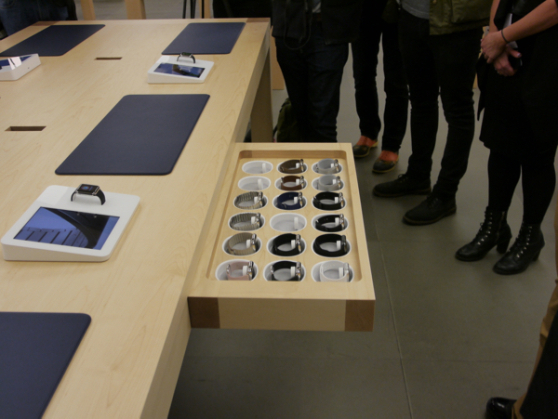 Did you experience an Apple Watch try-on appointment today? What did you think of it and did going hands-on help your buying decision?